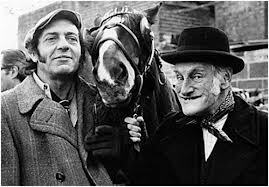 the geordie times online (newcastle united archive fanzine): THE TOON v THE STEPTOE RAG & BONE MEN FROM SHEPHERD'S BUSH *** TOONEET! THE TOON v THE STEPTOE RAG & BONE MEN FROM SHEPHERD'S BUSH *** TOONEET! Tooneet we welcome that 'numbskull' of a manager Ian Holloway and hiz QPR side to SJP and (hopefully?) we will grab the 3 points on offer az well! If wor 6-0 annialation of 'The Steptoes' @ Loftus Road orlier this season iz anythin' to gan by, then the points are in the bag! 'The Biscuitmen of Readin' won again last neet and are nuw anly THREE points behind us in thord place, havin' played 2 games more! We expect at least NINE changes from the team that 'played'? at Oxfaad on Saturday and anly a win will de! 'The Steptoes' have anly sold 500 of their 1,500 allocation of tickets, so expect a sub 50,000 crowd this evenin'! A full and compreeehesive match report will appear here sometime tomorrow! Az per usual, "Watch this space!"